The Fitbit Aria and Fitbit Aria 2 are bathroom scales that connect to your PC or smartphone to help you keep track of your weight. What Is the Fitbit Aria? The Fitbit Aria models are Wi-Fi-enabled smart scales that can detect a user's weight, body mass index (BMI), and lean mass or body fat percentage. Each scale displays the information on its own screen before sending the data to the Fitbit servers where it syncs with the connected Fitbit user's account. This data can then be viewed on any of the free Fitbit apps in basic charts and visualizations. Up to eight individuals can use the same Fitbit Aria scale. 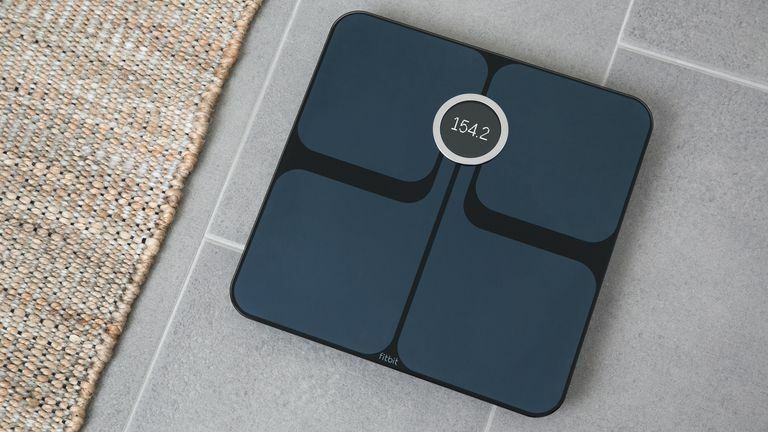 The smart device automatically detects who is using it by comparing their data to the current person standing on the scale. After the initial Fitbit Aria setup, there's no need to log in or out to switch accounts. How Are Fitbit Aria and Fitbit Aria 2 Different? Both Fitbit Aria smart scales can detect weight, BMI, and lean mass and can sync to online Fitbit accounts. The Fitbit Aria 2 does feature several improvements over the original, however. Here's how the Fitbit Aria 2 is different. The Fitbit Aria 2 has improved accuracy with its readings. The physical design is slightly different with a larger screen. Better Wi-Fi network compatibility that allows it to detect and connect to more types of Wi-Fi signals. The Fitbit Aria 2 has Bluetooth functionality which allows it to sync to a Fitbit app that's installed on a Bluetooth enabled device such as a smartphone or tablet. The weight limit on the Aria 2 has been increased to 400 lbs. The original Aria was limited to users that weighed under 350 lbs. The screen on the Fitbit Aria 2 displays animated greetings and icons for each user. Before you can set up your Fitbit Aria scale, you will need the following. Your home Wi-Fi network name and password. Option 1: A tablet, smartphone, or computer with the free Fitbit app installed. The Fitbit app is available for iOS and Android tablets and smartphones in addition to Windows 10 PCs and Windows 10 Mobile Windows phones. Option 2: A Windows PC or a Mac computer. Using the official Fitbit app is the fastest and easiest way to set up a Fitbit Aria 2 smart scale. If you have an iOS, Android, or Windows 10 device, this method is highly recommended. The method for setting up a first generation Fitbit Aria and the Fitbit Aria 2 are almost identical. The only difference will be the additional options given to Fitbit Aria 2 owners for selecting user icons. Turn your Fitbit Aria 2 smart scale over and pull out the paper tag. This will allow the batteries to connect to the device. This will also automatically turn on the Aria 2. If you own a first generation Fitbit Aria scale, you'll also need to remove one battery from the device, wait 10 seconds, and then reinsert it to activate its setup mode. Place your Fitbit Aria on a wooden or tiled floor. Open the Fitbit app on your smartphone, tablet, or computer. If you're not logged in, you will be prompted to do so. You will also be offered the chance to create a Fitbit account if you don't have one. The Fitbit apps are fairly uniform across devices so these instructions will reflect the setup process no matter which phone, tablet, or computer you're using. Make sure that your device's Bluetooth is turned on. Click on the icon that looks like a membership card (a horizontal rectangle with a circle and three lines inside it). This will take you to an accounts and devices settings page. Click on Set Up a Device. The next screen will show a list of Fitbit devices. Find your Aria model on the list and click on it. If you're unsure which model you own, check the underside of the device. A first generation Fitbit Aria will have a bumpy underside while the Aria 2 will be smooth. You will then be shown a summary screen of the device. Click on Set Up Your Fitbit Aria 2 (or Aria) to continue. The next screen will show links to the typical usage and privacy policies. Feel free to read them and then click on I Agree. The app will then search for your Fitbit Aria automatically. Once it's detected, your Fitbit Aria scale will display a four-digit PIN code and the app will ask you to enter it. Enter the code in the app. This will make sure that this specific scale is linked to your Fitbit account. Once the smart scale processes the PIN code, your app will begin the Wi-Fi setup so that your Aria can sync data to the Fitbit servers. Click on Next to begin the process. The Fitbit app will show a list of available Wi-Fi networks. Click on yours. Enter your Wi-Fi password and click Connect. If your Fitbit Aria was able to connect to your Wi-Fi network, a tick will show on its display and your app will show you a message confirming the connection. In the app, click on Next to continue. During this next stage, you will be asked to choose an icon to represent yourself when using the Fitbit Aria 2 scale. This icon will display on the Aria 2's screen after each time you weigh yourself to confirm that the data is being synced with the correct Fitbit account. Tap on your preferred icon and then click on Select. This step will not show for first-generation Fitbit Aria owners. The Fitbit app will then show you some tips for using the Aria scale. Click on Next to proceed through the tips. The Fitbit app will eventually request that you perform a test weigh. Remove your shoes and/or socks and step on the Aria. Click on Next within the app. You will then be shown some more screens with further Fitbit Aria tips. Click Next to progress through these screens and finish the setup process. During your test weigh or your first weigh session after setting up the Fitbit Aria 2, the screen may display your chosen icon and a cross and tick option to confirm that the correct person was on the scale before syncing the data to their Fitbit account. When this happens, step off of the scale and then use one foot to tap on the relevant side. If the cross is shown on the left side of the display and the tick is shown on the right, tap on the right side to confirm that the correct icon was shown. Tap on the left to let the Aria 2 know that it detected the wrong account. If you don't have a smartphone or tablet, an optional setup method is available that uses a program that can be downloaded from the official Fitbit website. If you own a Windows 10 PC, it's highly recommended that you download the Fitbit app and follow the steps mentioned above as that method is much more reliable. Download the relevant program for your computer and open it. On this next screen, log into your Fitbit account or create a new one by entering your email and a unique password. If you're creating a new account, you will be asked to enter your gender, height, and other personal information. The program will then ask you to name your Aria scale. You can call it anything you want. Enter your name for it and click Next. You will then be asked to place your scale in Setup Mode. To do this, remove the paper slip that's in battery door of the Fitbit Aria. If this doesn't work, you will need to remove at least one battery from the device, wait 10 seconds, and then place it back in. The Aria's display will tell you it's in Setup Mode if done correctly. In the program, enter your Wi-Fi network's name and password. Your computer will send this information to your Aria which will then connect to Fitbit's servers to complete the setup. This can take up to two minutes to complete. If successful, a smiley face icon will show on your Aria's display and the program on your computer will give you a completion message.